Last year about this time I reviewed a wonderful picture book by my friends Greg and Amy Newbold; If Picasso Painted a Snowman. It’s a really wonderful book and a great way to introduce kids to different artists and movements in art. Greg and Amy created a follow up book and I think they outdid the first one. 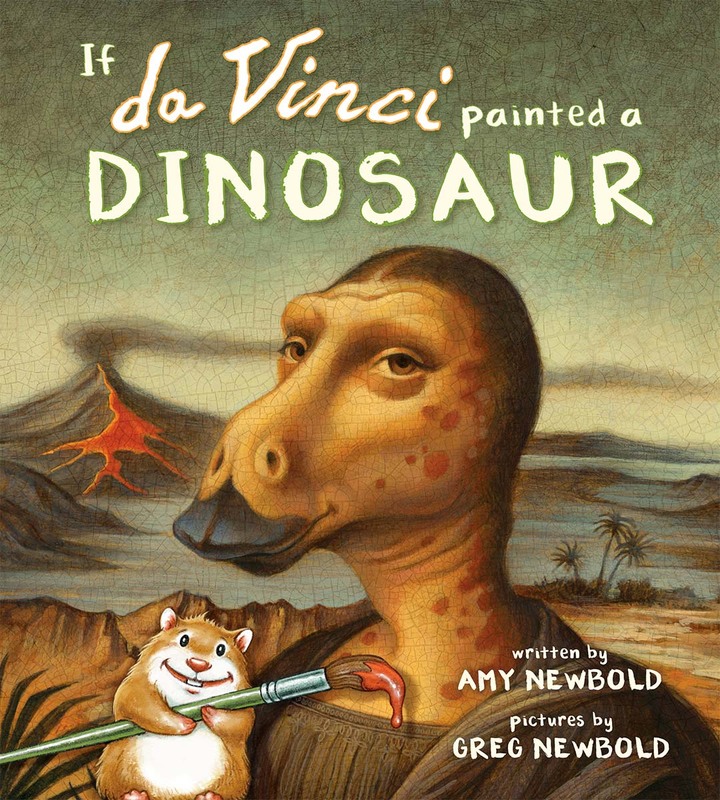 It is titled If da Vinci Painted a Dinosaur. Once again they have created a book that I believe kids will enjoy as well as adults reading it to them. It’s interesting to see Greg’s fun takes on a wide range of artists and how he and Amy incorporate dinosaur references into the writing and and artwork. The variety of styles are also impressive. I think Greg did a great job emulating artists like Degas, Hokusai and Munch. 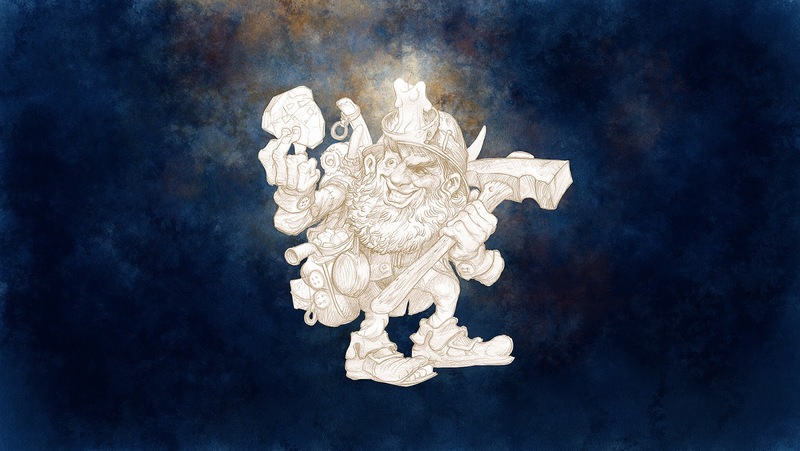 I sent the Newbolds a few questions to answer.I think you’ll find his answers interesting and give some cool insight into the creation of a book like this. You have worked on a lot of books. Was there any thing different about doing this one that made it more difficult? Are sequels more challenging than the previous book? After If Picasso Painted a Snowman was finished last year, we didn’t have any intention of making a sequel. Advance response was positive and our publisher, Tilbury House called and asked us to consider a companion book. 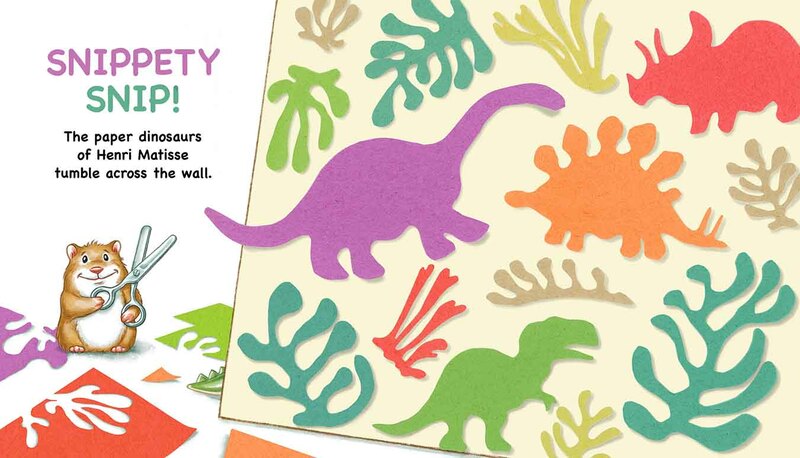 That caused a bit of stress but Amy and I put our brains together and settled on dinosaurs as a theme. The time frame was much compressed, since the first book was already written when we landed the deal. 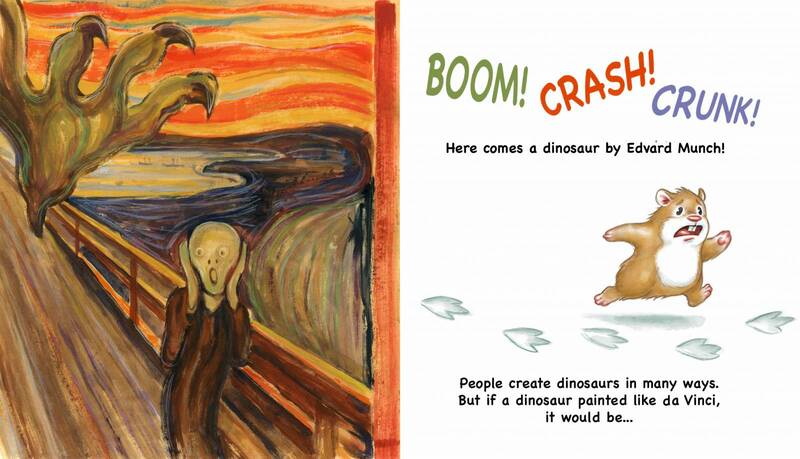 Amy had to write If da Vinci Painted a Dinosaur and I had to illustrate it in a much shorter time frame. I did the art in about three months while also mixing in a few other projects. It was the quickest turnaround of any book I had ever done to that point. Outside of the time frame, the challenges were similar to the first book. Imagine channeling the style of nineteen different artists, one after another. It’s a bit intimidating at times. 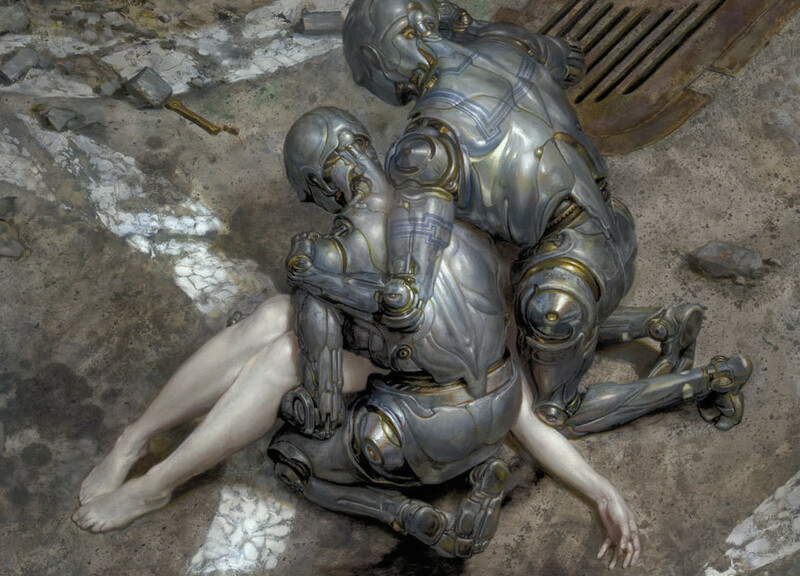 Painting pieces that mimic famous paintings or art styles can be difficult. Describe the process of creating homage to another artist’s style while still retaining your own voice? Try as I might, it was impossible to truly mimic the styles of all these different artists. That’s fine. I knew that a fair amount of my own style would filter into the work. My goal was to show the diverse styles of all the chosen artists in a fun way that is relatable to kids. 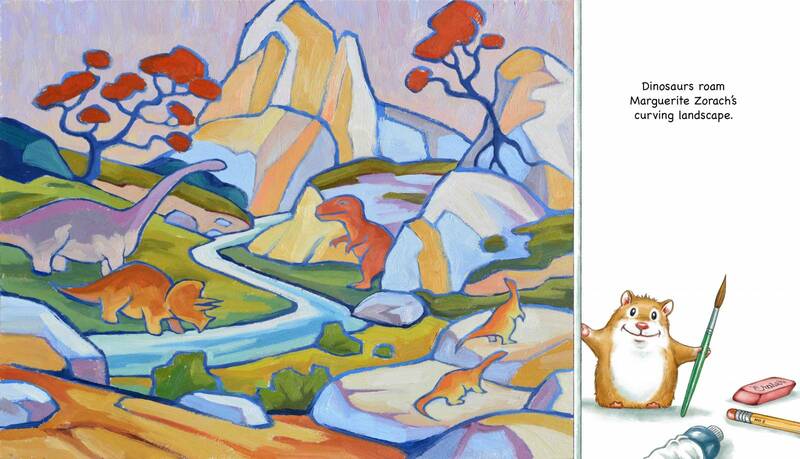 None of these artists ever painted a dinosaur; so it freed me up to create my own interpretation. 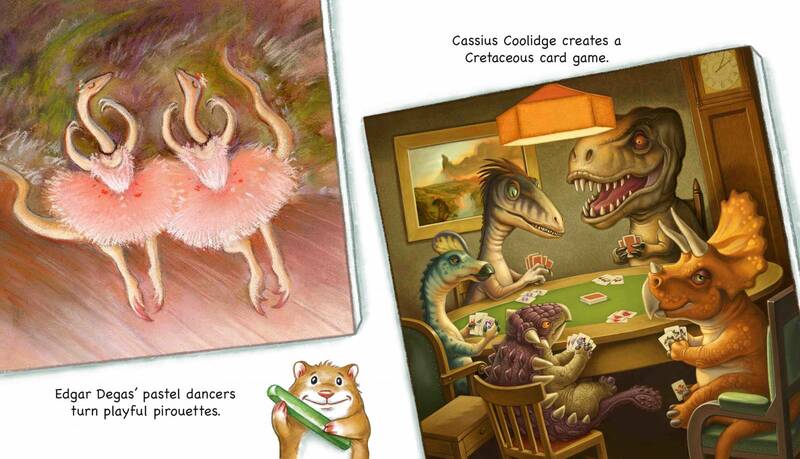 Some pieces, like the card playing dinosaurs feel pretty close to my own style. Others like Hokusai’s wave homage were much closer to the original. Do you have a favorite piece from the book? Why? It’s hard to choose a favorite piece. I like all of them for different reasons. Some were a struggle and others flowed quickly. Some made me giggle more than others, like the Munch’s The Scream parody. I tried to paint it as much like the original as possible but added the dinosaur foot to give a reason for the screaming figure. I also really like my take on Franz Marc’s Blue Horses in which I pay really close homage to the original composition and color palette. 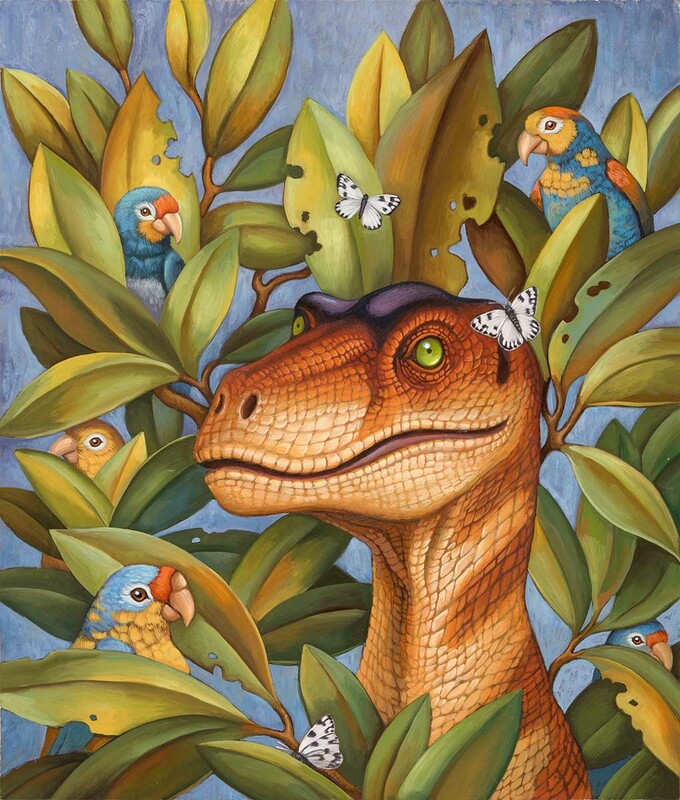 I wanted it to feel like my piece was an alternate “lost” version with dinosaurs instead of horses. 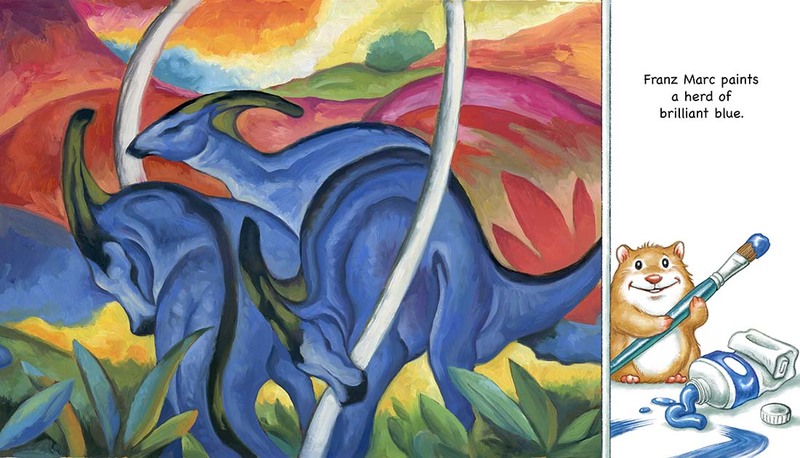 And of course, the da Vinci Dino Lisa I did for the cover was a kick to paint. I knew it was all going to be in the eyes and I think that aspect works well. I also had fun playing with the landscape, adding an erupting volcano and some palms. The crackle pattern was added digitally to give it some age. I was too scared to experiment with an actual crackle glaze for fear of ruining my painting, so digital crackle did the trick. What was it like to work with your wife Amy, the author of the book? Collaborating with your spouse is awesome! After so many years of working on my own or other’s projects, it was a riot to be able to make something together. Our publisher gave us the luxury of pretty much full control of the final product. For If Picasso Painted a Snowman, Amy had pretty much written it when we landed the deal. For this book, there was much more of a collaborative brainstorming process. I ended up suggesting some of the artists and pieces to parody and then Amy would come up with the words to accompany what I hoped to create. She had other artists in mind and I had to figure out how to make those work. Some we discovered together. There was a lot more back and forth to craft this book. We were also unfortunately forced to have a few “working lunches” along the way to iron out details over a nice meal too, ha ha! It was a lot of fun. I heartily endorse working with your spouse. What was Amy’s goal in writing the book? Who did you both have in mind when creating the book? The point of these books is to introduce kids to many different art styles and do it in a fun way. We also want to show that there isn’t a particular “right” way to create art. Hopefully the books give kids permission and freedom to create their own art without constraints. When you are true to yourself, magic happens. Amy, what was your favorite painting in the book? It is so hard to choose just one. As I researched artists, there were several that I became quite attached to like Alma Thomas and Harrison Begay, and then when Greg did the art, it was such a beautiful representation of their work and turned out even better than I imagined. I think perhaps the Aaron Douglas Jurassic jazz band piece is one of my favorites. I think if Aaron Douglas were alive and working today, he would be very successful. 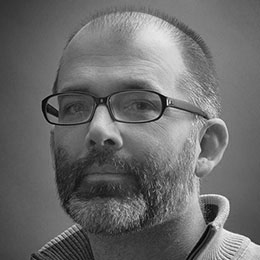 He had amazing design sensibility, and I love his style. 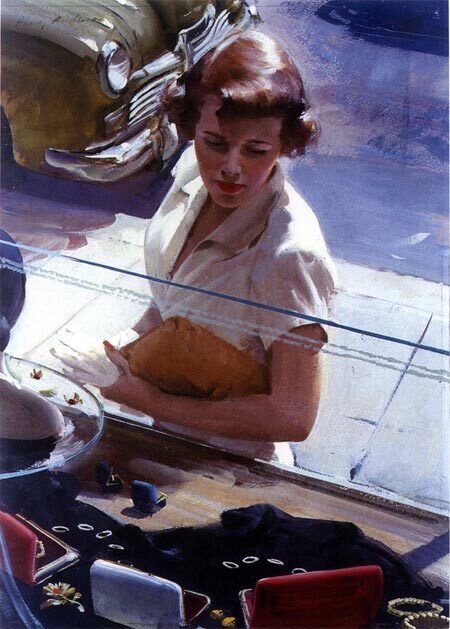 Greg really achieved the feel of Douglas’s work, and effectively rendered the layered style Douglas used in some of his paintings. I love the colors and design of the piece. It is playful and beautifully done. You worked in a lot of different mediums for the book? What were they? Is the Chinese watercolor digital, or actual watercolor? I worked in acrylic, oil, ink, pastel, colored pencil, cut paper, hand cut rubber stamps and digital for this book. Hokusai’s Great Wave parody was done digitally. There was no way I could have spent the time needed to replicate that woodcut style. Many of the other pieces that would have originally been done in oil were done in acrylic because of time constraints, but I tried to be as true to each artist’s working methods as reasonably possible. The Chinese brush painting just about ruined me. 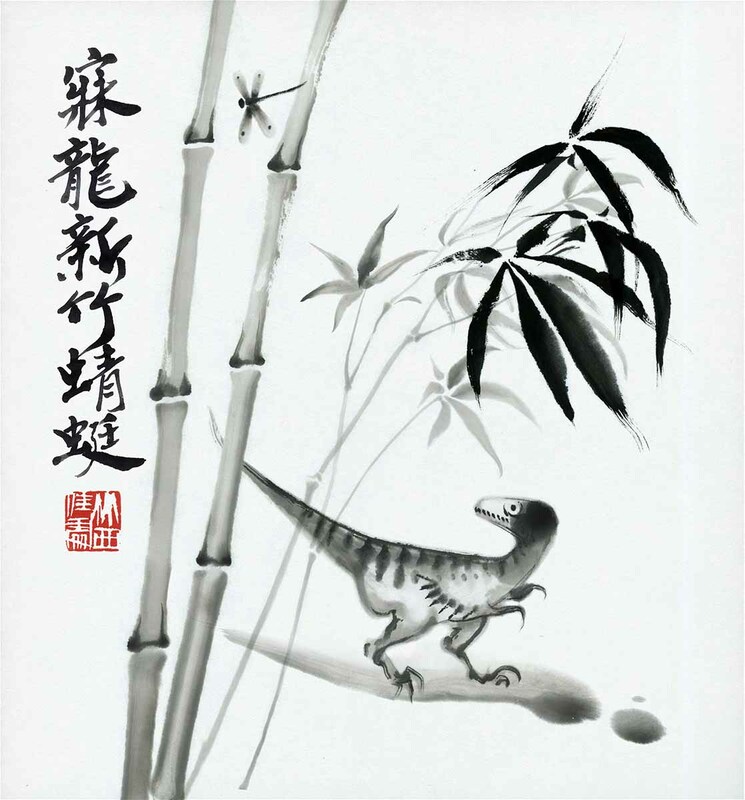 Qi Baishi is one of China’s best-known artists and I doubt I did him any justice, but I did choose an actual Chinese dinosaur and attempted to paint in his style. What I didn’t really realize was that you don’t just sit down and learn Chinese brush painting in a few days. I practiced for as long as I reasonably could over a period of a few days and then attempted to do a painting. Well, it was a disaster. I would get a part of it looking good and then destroy it with a muffed stroke. I finally resorted to painting multiples of each element and then choosing each of the best elements and pieced it all together in Photoshop. There are probably parts of about fifteen or twenty different attempts combined to make the final pieces. Then there was the lettering. I didn’t even want to attempt that, so I asked my friend Yong Chen to create the lettering for me. In the end, I am pleased with the illustration, but it doesn’t actually exist in real life outside a pile of failed attempts. I will be honest, one of the things that intimidated me the most before the first book was the idea of trying to mimic so many different artist’s signature styles. It’s sort of like trying to forge the signatures of famous people. It’s impossible to get inside the brain to hand connection of another artist, try as you might. I looked for the hallmarks of what made each artist unique. 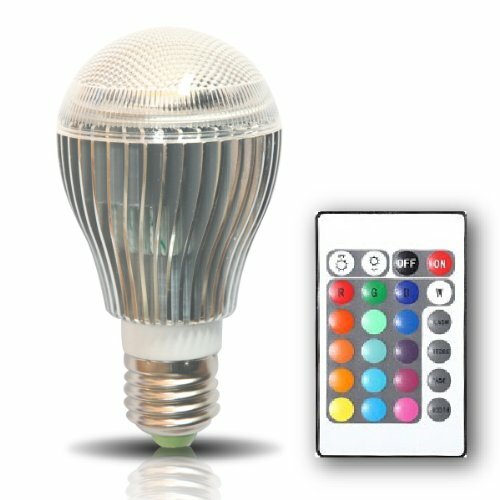 What were the drawing quirks, colors, design sensibilities, textures or techniques that set them apart? I read about what their motivations were, what they were trying to accomplish in their work. By attempting to get inside each artist’s head, I gained a whole new appreciation for their work. 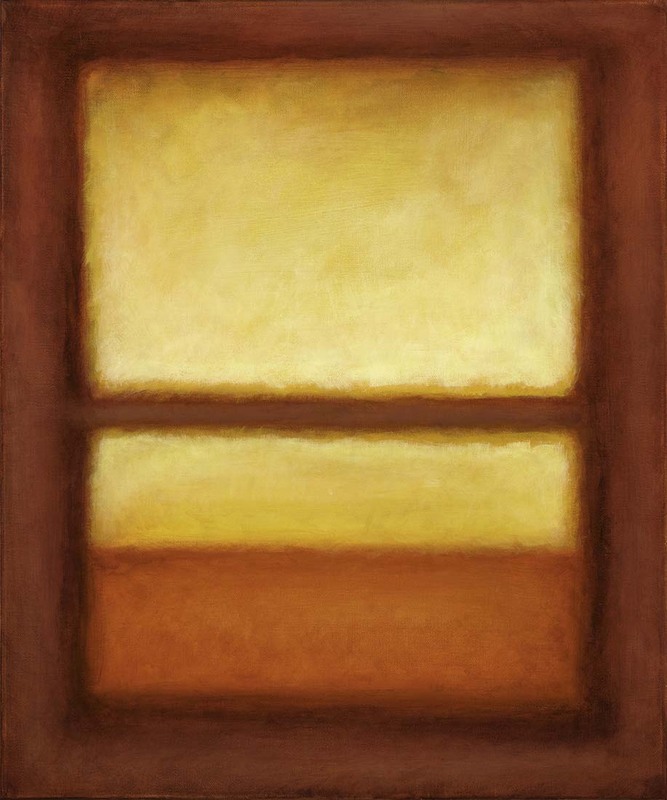 Rothko was one artist that I had not really appreciated before, as with many abstract artists. I didn’t understand what the big deal was or why so many people admire his work. After researching his career and techniques, I grew to really appreciate what he was doing. My version doesn’t really come close to his color field work, but I did work in the multiple transparent washes as he did and let some of the edges vibrate against each other. Considering it was a one shot deal, I like my Rothfaux. It hangs in my bathroom, which is appropriate considering how far my effort comes to resembling the real thing. All in all, I think it’s a really valuable exercise to try to create master copies or emulations. I tried things I would never have tried and learned things that would have been impossible to learn any other way. What new skills or knowledge did you gain as a result of working on this book? I learned that I will never be a Chinese brush painter nor do I have the patience to attempt actual woodcut printmaking. I learned so much about artists that I had not previously paid much attention to such as Matisse and Warhol. I discovered I really like their work! Over the course of two books now, I would say that I have broadened my appreciation for many artists and learned many new skills. I expect this learning curve will continue as we are gearing up to create a third book due out next year. Rough sketches are approved and I am gearing up for the final pieces. I have my work cut out for me, as the next book will play off such artists as Franz Kline and Jean Michel Basquiat. Should be plenty of fun! 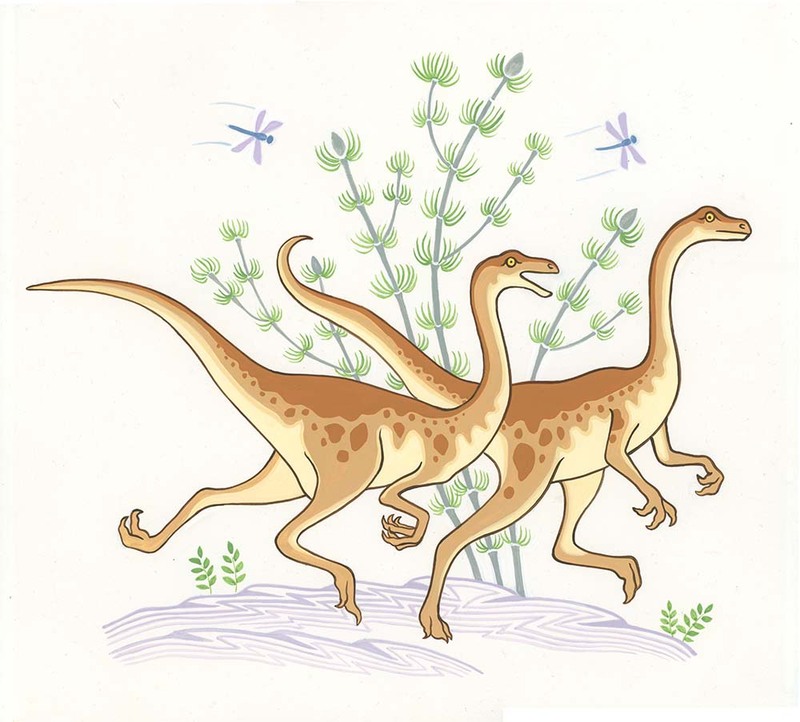 At the end of the book is a blank page that looks like a drawing pad on an easel that the reader can copy and paint or draw their own dinosaur. After that is a table that gives a short biography on each of the artists that were represented in the book. 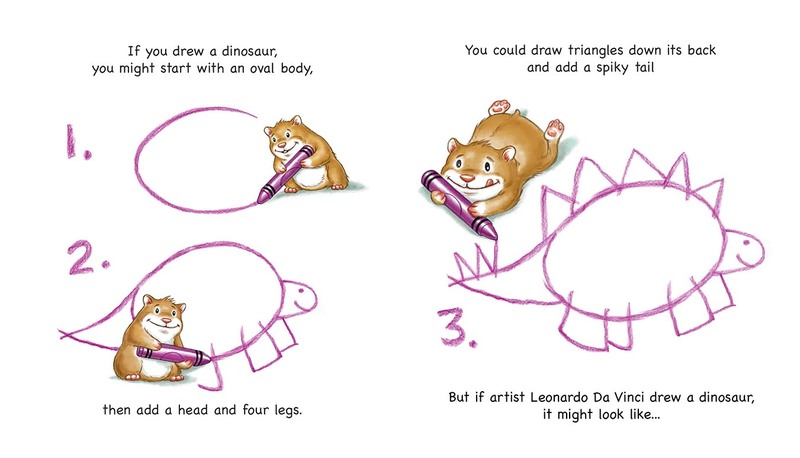 Also included is a guide to all the dinosaurs and some tips from Greg for young artists. In short, I think this is a great book for young aspiring artists and for classrooms to introduce a wide range of artists to young minds. Even better, adults will find it interesting and fun to see new and familiar styles. I have done master copies, but I haven’t ever done a finished piece specifically aiming to work in another artist’s style. I might have to give it a try!